Fifty years is enough time to tell the difference between a journalist whose memoir of growing up in Winnipeg failed to notice there were any Ukrainians in Canada; and another whose memory of growing up Ukrainian in Alberta failed to notice Canadians. The first was Melinda McCracken (lead images, left and centre) whose friendship I first made in Montreal in 1967, when she was a reporter for Montreal and Toronto media. She died in Winnipeg almost twenty years ago, but left behind Memories Are Made of This – a memoir of Winnipeg in the 1950s. The other is Chrystia Freeland (lead image, right), whose entire career, including time at the Globe and Mail in Toronto, has been spent promoting an idea of Ukraine for which she has advocated a war for which Canadians will go on paying into the future without end. I didn’t so much meet McCracken as I was met by her. It was late morning in Montreal’s Westmount Park, a few hours after I came in on the overnight Greyhound from Toronto. A demonstration against the US in the Vietnam War was assembling in the park. In a crowd of thousands McCracken stood out. She was tall, strikingly beautiful, and carried herself like noone around her. I managed to get in her way. She spoke first, asking how I happened to be there. She started in French, so I replied in the same. When I said I was a reporter, come to Montreal for the World Expo, our friendship began. That afternoon she took me to meet her friends at the apartment of Irving Layton, then the Canadian poet next to Leonard Cohen in popularity. Layton and Cohen were in France at that moment. 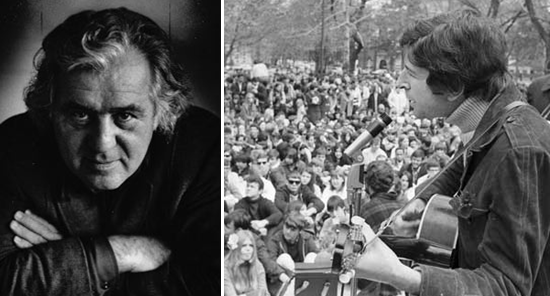 Left: Irving Layton, 1960s; right, Leonard Cohen, Toronto 1967. One of McCracken’s friends at the party said he was moving into the downtown apartment of his lover for a while, and offered me a loan of his uptown house for as long as I was in Montreal, or for as long as his lover would have him, whichever came first. McCracken drove me uptown in her red Morgan roadster. I had been counting myself pretty unhappy in Boston, where I’d spent the weeks before; and so I fled north. Montreal was civilization at last, I thought. With McCracken I thought my luck was about to change. Much more than luck, though, McCracken was the first to teach me what changes after you cross the frontier, and what is very different about Canadians. The second to teach me that was Glenn Gould. But that’s another story, and there have been only two lessons, two stories. Since McCracken and Gould have left this earth, Canada is not as it was. Freeland is a big reason for that. Russia has nothing to do with it. The Ukraine and the US, everything. The gentle irony towards the country McCracken represented starts and ends her book. The first line is: “Winnipeg is one of the flattest cities anywhere.” The last line is: “It was as cold as it ever was.” In between is a display of wit that defies the two great enemies of Canadian culture preoccupying McCracken when I knew her – and which she has put down in print. The enemies weren’t the topography or the weather – they were things Canadians had to accept because they were unchangeable. The enemies were Great Britain and the United States. They could be resisted, or so McCracken thought. McCracken had a very full experience outside Canada, so she knew plenty of flatness and coldness with which to compare Winnipeg. Born in 1940 into a middle-class family of school teachers – her father gave that up to sell life insurance – she attended Riverview School and Churchill (yes, him) High School, and it’s her time in both that comprises her book. By the standard of Marcel Pagnol’s autobiography of childhood and schooldays around Marseille – two volumes, 510 pages in all — McCracken’s 118-leaf memoir is slim. But then compared to the south of France, Winnipeg was very flat and very cold. After McCracken graduated from high school in 1957, she went on to get her B.A. Hons. from the University of Manitoba. From there she started in journalism at the Winnipeg Free Press, but dropped that to go to Paris in 1962 and then on to London. When she returned in 1964 she lived and worked in Montreal. When we met in 1967 she was reporting on Montreal for the Toronto Star, as well as for Canadian Broadcasting Corporation (CBC) TV. The next year she moved to Toronto, where she wrote for Maclean’s and the Globe and Mail. In 1976 she returned to Winnipeg, and died there. Remembering from the year 1974, when the Ontario Arts Council gave her a grant to write her book, to the quarter-century before, McCracken never mentions the summer. If there’d ever been one, and if she had gone swimming, she doesn’t think it memorable to report. Protracted winter was one enemy; spring flooding of the Red River was another. But loss of job or income, family breakup, local violence, fatal accidents, lethal disease, war or threats from outside the country – they go unreported in the book, uncontemplated by McCracken’s peers, apparently unheard of. For the Canada which McCracken describes provided security, health, social stability, the promise of prosperity. And in exchange there was hard work and strict compliance with the authority of parents, church, school. That’s the only mention of Jews in the book. Nor is there one of the indigenous peoples. Blacks were not met except on the radio or jukebox. The phonetic spelling of Uker-ainians is indicative. There had been a first wave of newcomers from the Russian empire at the start of the 20th century. There were more after World War II. But McCracken never encountered them. The population of Winnipeg doubled to 136,000 in the first decade of the 20th century, and continued growing to 236,000 by 1951. Another 30,000 arrived by birth or immigration during the decade covered by McCracken’s story. But who they were, where they had come from, what they were like, or what they believed – that was another story; one McCracken didn’t tell because she couldn’t. Winnipeg stopped growing in the 1960s. It didn’t begin to revive until the late 1970s. Nowadays Winnipeg has a population of just over 700,000. Its British comprise 39%; white Canadian, 16%; German, 16%, Irish, 13%; French, 13%. The city also has the largest concentration of First Nations, Inuit and Métis of any Canadian city, 11%; plus 9% of Filipinos. The Ukrainian minority is almost 100,000 (15%); not as numerous as the Germans, but there are more Ukrainians now than either Irish or French or First Nations. After winter, communism was the only dark force McCracken’s generation recognized, but not often. “People didn’t run the risk of being considered a kook or a square or a communist, by taking a chance with odd behaviour. Nobody rocked the boat. People were really afraid of communists, not because they understood communism or capitalism, but because they were being programmed to be afraid. Communists stood for the dark forces of anarchy, disorder, degeneracy, lack of structure, and were thought to be infiltrating everywhere.” Cold war, nuclear war, Soviet Union – these terms don’t appear because they were never mentioned. Chrystia Freeland was a reporter to start with in Kiev, Moscow, and then Toronto. At 49 years old, she is too young to have known or worked beside McCracken at the Globe and Mail. Freeland is now a member of parliament for a Toronto riding, and since January Canada’s foreign minister. In the little story-telling she has published about her Ukrainian family, she has lied – and those lies have become a national controversy over her fitness to continue in office. For the investigations under way of the role Freeland’s family and she have played in one brand of regional Ukrainian nationalism, plus the murder of Jews, Poles, Russians and “communists”, click to read this. Omitted from the Freeland story is that Grandfather Wilbur was the lawyer whose firm gave Freeland’s mother her first job as an articled law clerk. By then she had married Wilbur’s son Donald, also a lawyer, and Chrystia’s father. Donald Freeland remains a darker secret in the Freeland biopic than the Nazi career of Freeland’s Ukrainian grandfather, Michael Chomiak. One thing that’s certain about Father Freeland is that he is not dead, as has been reported on the internet. Messner Gelineau, a law firm which Freeland used to run in Peace River, Alberta, bought Freeland’s practice three years ago, and he turned to farming. The law firm confirms Freeland is alive. From left to right: Michael Chomiak; Wilbur Freeland; Halyna Freeland, Chrystia Freeland’s mother. No photograph of Donald Freeland has been found. Six is a peculiar number for Chrystia Freeland to remember her grandfather saying. As Michael Chomiak rose in the ranks of the German military occupation, and then as he fled with the retreating German Army, he lived in Ukraine, Poland, Austria, and Germany, where he went to work for US military and spy services conducting operations against the Soviet Union. Although he eventually was allowed to emigrate to Canada in 1948, that would make only five countries. The sixth country Chomiak has kept secret, as does Chrystia Freeland. It is likely to have been the US. 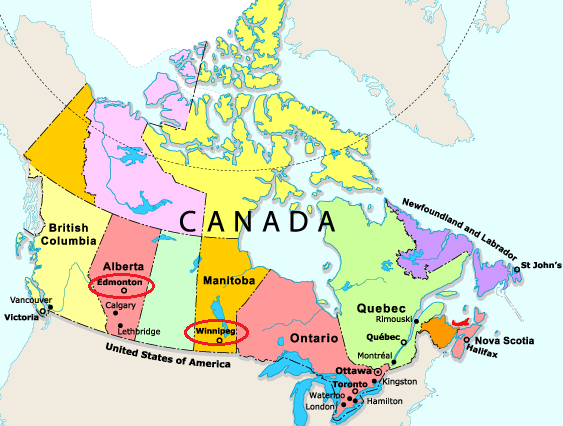 But if so, during the time between 1946 and 1948 when Chomiak was employed as a US agent; and if Chomiak wasn’t allowed to stay in the US, the real reason for his move to Canada has yet to come light. Freeland’s Canada turns out to have been the opportunistic choice of a war criminal on the run; and also of a western Ukrainian, a Galician, whose passion – Freeland’s word – was to return to the land he had helped the German Army create by trying to murder everyone else who didn’t share Chomiak’s ethnic origin, national ideology and race hatred. That is now Freeland’s passion too. She and the Ukrainian population of Canada have arranged for the rest of Canada to pay for it, and to send Canadian soldiers and weapons to see to the job. Not much persuasion has been necessary, and no political contest. As McCracken’s story explains, Canadians don’t think much about it because it has been programmed into them as part of their bargain for the delivery of US prosperity. Memories of Canada as it was are now made of this. Note: Gerold Rupprecht adds his brief memoir of growing up in Winnipeg the decade after McCracken. The Ukrainian community was very close to the German community in Winnipeg (they were both anti-communist). The kids in school talked about Bandera before I had any idea of who he was or what he represented. Both communities were viciously racist. The Ukrainians had their own version of scouts, (Plast – Ukrainian Youth Association of Canada), that was modelled, in my mind, after the Hitlerjugend. You can find archive films from their web-site. From my experience, the native Indians were the lowest on the social hierarchy. Winnipeg was and still is one of the most violent places in Canada to be a native Indian despite efforts of people like John Morrisseau (a residential school survivor and esteemed Métis leader from Grand Rapids, Manitoba). My first school years were on an Indian reservation, at Grand Rapids, northern Manitoba, where my father worked as an engineer for the Hydro dam construction (we were in Winnipeg to build the Red River flood controls). reserve often came to school late, with no breakfast, no lunch bag. They would say they forgot it. In truth, there was nothing left to eat at home. I shared what I had. Little did I know what we whites were doing. The one time when I stayed after school and went to my native friend’s home nearby his mother gave us both something to eat. I had no idea what that meant at the time. Corporal punishment was the rule. I can confirm the use of the strap. It was appalling to be beaten like that. It happened to me once. Indian classmates were beaten far more often as they were often late for class. I am 59 years old and it still pains me to this day. The beatings were a regular occurrence. The same attitudes to beat children existed at home in many families, including my own. It has left emotional scars not just on the victims, but also the witnesses. My mother asked me for forgiveness in my last phone call with her before she died for not intervening to protect me. You cannot imagine how much that meant to me. I was a German speaker and other whites taunted me as being the “little Nazi”. There was and still is a hierarchy of racism in Canada. I have attached a file describing the effects of the Grand Rapids hydro dam on the community. I came across an article that before the dam, over a thousand people lived from fishing at Grand Rapids, with over a million pounds of fish taken each year, needing 3000 tons of ice to pack the fish for Chicago restaurants. Today, only 291 people live there. Many left to search for a new life in the city of Winnipeg. To this day the dam has no fish ladder. The dam destroyed the lives of hundreds. The Manitoba government should be shamed into doing more, much more. The 5.5 million paid for the dam construction is a bad joke compared to the over 1 billion CAD generated electricity (until 2005). The Winnipeg Ukrainians continue to support the putchists in Kiev, lobbying the Canadian government to send troops to train Ukrainian soldiers in their “anti-terrorist operation”. They recently sent 6 million CAD for soldiers medical kits. These people prefer supporting people half a world away, rather than “the scum of the earth” under their noses. Melina McCracken, sadly, seems to have been totally oblivious of the racism that surrounded her, epitomized by the impoverished, alcohol and drug addicted Indian women who prostituted themselves so there would be something to eat for their children. The snide remarks were they were Indian princesses in the evening and dumped squaws the following morning. Their fate, like the winds at the corner of Portage and Main Street (Winnipeg) remains unchanged.